Seamus Gilbert, 18, stands next his dump truck at his office in Nobleboro, Tuesday, Sept. 4. Seamus Gilbert, 18, of Bremen started his own excavation business early this summer, shortly after his graduation from Lincoln Academy. 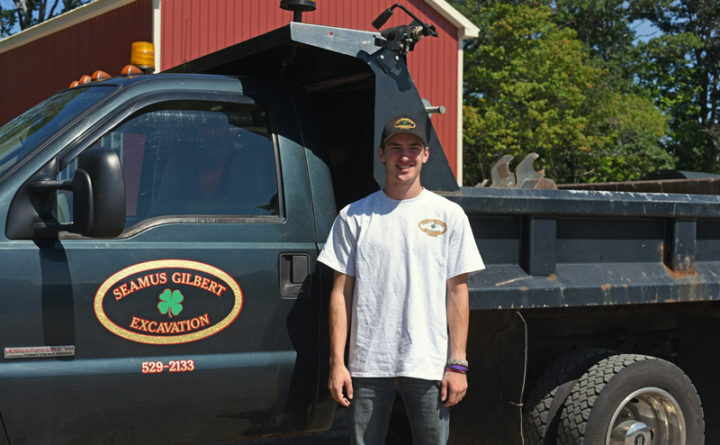 His business, Seamus Gilbert Excavation, brings the number of businesses his family owns to five. “Being self-employed is a large value in my family,” he said. His father, John Gilbert, owns J.A. Gilbert & Sons Inc., a paving business; J.A. Gilbert Concrete Pumping LLC; and Roy Griffin Septic Cleaning LLC. His mother, Melanee Gilbert, owns Maine Fresh Lobster Inc.
Seamus Gilbert said he used to be a fisherman, along with his father, but when his father decided to leave fishing for paving, he knew he wanted to consider a different career as well. “I might as well start now,” he said. He now shares an office space with his father at 233 Upper East Pond Road in Nobleboro. “People think it’s crazy when they find out I’m 18. It’s kind of normal for us,” he said. Seamus Gilbert has a Caterpillar excavator, a Caterpillar skid steer, a Ford F-550 dump truck and a pickup truck. “I’d drive my dump truck to school sometimes, and all the kids would get a kick out of that,” he said. This summer he has worked on jobs such as digging small foundations, digging trenches for power lines and regrading gravel driveways. “I can do any small job. No job is too small,” he said. His logo is written in his favorite color, gold, and features a four-leaf clover, a nod to his Irish roots. Seamus Gilbert Excavation has one other employee, Jake Fowler, a sophomore at Lincoln Academy. Seamus Gilbert has been plowing driveways since he was 11 and will continue to do so this winter, but with a truck rather than the four-wheeler he used as a kid. Seamus Gilbert said he is often subcontracted by Rob Hyson of Medomak Construction Inc.
“He’s been really good to me, getting me work,” he said. Seamus Gilbert said he hopes to grow the company in the future and get his class A commercial driver’s license, which would allow him to operate larger vehicles and pull trailers. For more information, contact Seamus Gilbert at his office, at 207-529-2133, or by cellphone at 207-592-3934.